Requesting and replenishing supplies is a breeze. No more phone calls or spreadsheets! Keeping track of what locations need what supplies can be a full time job. The right supplies can make the difference between doing a great job and not being able to do your job at all. Swept makes requesting and replenishing supplies a breeze. No more phone calls or spreadsheets for inventory management. Logistics and supply management all in one place! 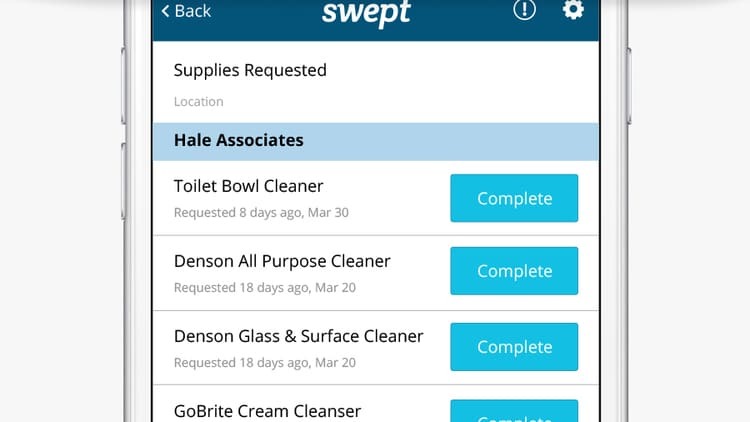 Cleaners can use the Swept app and SMS to request any supply that managers assign to a location. Cleaners can even let you know if you’re running low or completely out so you know how urgent it is. Managers can use the manager’s web app or mobile app to get a real time update on what is required where. Swept will even generate a shopping list in case you want to stop by a local supplier the next time you’re out on the go. Swept is used by many companies just like yours to save time, improve communication, reduce costs, and organized the chaos. Watch our micro demo on Supply Tracking to see how Swept can help your business. "A total game changer for my company. 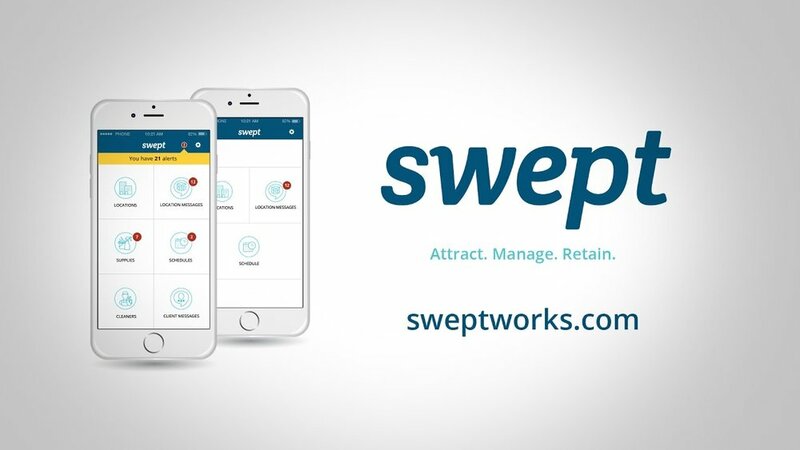 I grew my team 428% in 1 year, and I couldn’t have done it without Swept." Go beyond basic scheduling and time tracking. Increase efficiency and communication across your company, your staff, and your clients, get your day back, and stay competitive. Looking for Janitorial Supply Tracking Software? I didn’t think it was possible to find a piece of software that is this laser focused and specifically designed for my company. One of the best moments using Swept was when my staff connected the dots and started getting excited. They had the realization that this can work and was going to save them an immense amount of time. It was a game changer. How was I not using this before? Our day and night cleaning teams have never communicated before, but now they do – and the number of messages I receive has decreased greatly. Our morale has been boosted..
With a group of five managers, we are easily saving $10,000 a year plus fuel cost. We now have more accountability within our teams – where they are, what they are up to, and how we can help them. For our clients of the past 20 years, we are once again stepping it up. For our new clients, we are raising the bar. I am loving this software! It is making my life so much easier! Have nothing but praise so far. This is the first time owning a company and I’ve been in the industry for a long time and none of the big companies I worked for had anything like this. The support in getting up and running along with the overall Swept experience has been awesome. Have been using Swept for about 6 months-love-love-love!!!!!!!!! Our employees really like Swept, translation is great, they like this even more. The customers are very impressed, that we are using something like this. You guys are doing something nobody else is and we’re winning accolades with our customers all over the place. Swept is empowering our front line. Our cleaners. Designed from the bottom up, with the cleaner in mind. You were a cleaning company before and it’s obvious, or you wouldn’t have had the foresight to build something this great. I can’t wait to rave about this to everyone. 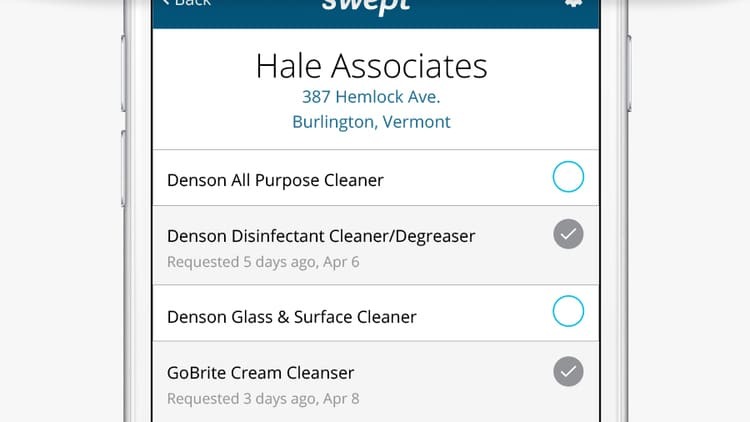 We have been using Swept for about 1 year, total game changer for my company! We have grown from 14 employees to 74 in 1 years time, we couldn’t have accomplished the coordination and communication amongst my team without the use of Swept. This company that you are apart of [Swept], you do provide darn good support for everyday issues we’ll face. Most softwares, you buy it and never hear from them but this is different. I feel like I’m in good hands. I think we won a new $103K job because of Swept. It was a church and they really liked the added level of communication.